Is ORANGE your corporate colour? Week 4 of 6: Orange Promotional Products! Check out Vivid Promotions' fantastic range of bright Orange Corporate Merchandise Items for your next promotion. With a great range of cost effective gift ideas presented in your corporate colour, we're sure to make your logo stand out. Select from our wide range of Orange Promotional Products such as Printed Orange Frisbees, Orange Badge Holders with logo, Orange Trade Show bags and Branded Orange Travel Mugs. Promote your corporate colours in style and watch your brand flourish! 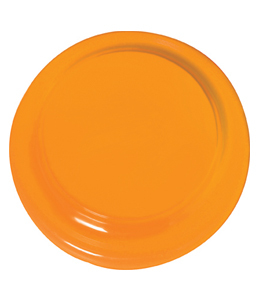 Orange FrizBees with logo: Vivid Promotions' Printed Orange Frisbee is a great way to get your brand flying around. Made from up to 30% Recyclable plastics, this 230mm Diameter Frisbee is a cost effective merchandise item. Ideal for show bags, giveaways, corporate functions and novelty promotions, the Orange FrizBee will leave a lasting impression! Orange Trade Show Bag: This colourful Orange coloured tote bag is a great way to promote your logo at a small cost. Match your corporate logo with this orange corporate coloured trade show bag and watch your brand grow! 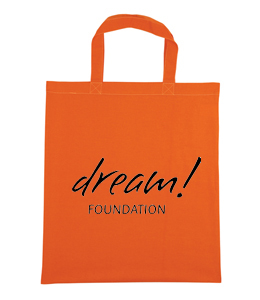 Vivid Promotions' Printed Orange Shopping Bags can be decorated on both sides and feature a short carry handle. Retractable Orange Badge Holder: Perfect for tradeshows, corporate functions, conferences and more! 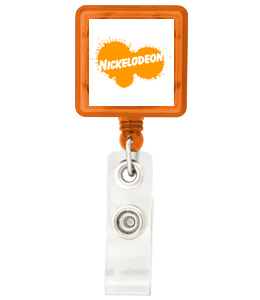 This Orange Badge Holder has a 383mm retractable reel with metal swivel alligator clip which can attach to name tags and also features a clip on the back. Presented with a full colour digital print and individual names or data this Orange Corporate Badge Holder is a great merchandise item! Printed Orange Perka Mug: Vivid Promotions' 450ml Travel Mug with print is a great promo item for any occasion! 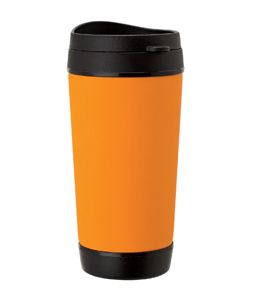 Featuring an orange insulated sleeve that can be customised with your logo, this Perka Mug is truly one of a kind. Available with up to a full colour transfer, this dishwasher safe Travel Mug also comes in a range of other corporate coloured sleeves to match your brand. Vivid Promotions' Printed Orange Promotional Products are the perfect way to display your brand and decorate your event! With a wide range of bright Orange Promotional products to choose from, Vivid Promotions' has the lot! Check out our Orange Decorator Balloons with print, Branded Orange Lanyards, Fluro Orange Piggy Banks, Custom Printed Orange Ceramic Mugs, Orange Sports Bags with embroidery, Decorated Orange Caps, Printed Orange Stationery Items and much more. Vivid Promotions' Orange Corporate Coloured Products are great for trade shows, corporate functions, fundraisers, brand launches and schools. Invest in a top quality product that is sure to fit well within your budget and create maximum brand exposure all year round. Contact us today for more information, pricing and samples.